Websites were boring several years back. The design didn’t actually matter that time or perhaps, people were more than glad to be able to step their feet on this new virtual realm. Those days are gone. We are now seeing it the way we look at the stone age. The word ‘Responsive’ started taking charge, developers already started flooding the market, so do the new frameworks and languages. When experts started realizing that design does matter, they saw the entry of Bootstrap as something inevitable for the immediate future. Now, a whole new online community is Googling the words like ‘free Bootstrap builders and hungrily waiting to crown themselves with the title – ‘web developers’. 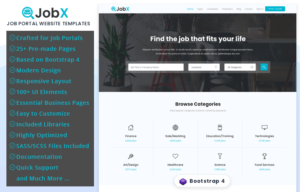 We have curated a list as a one-stop solution for the developers to choose their tool among the best paid as well as free Bootstrap editors available, and start working on their dream project right away. 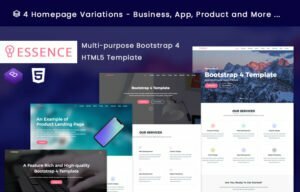 Anyone with no background in computer science, could drag and drop his/her way into designing a stunning website using this Bootstrap builder. You could be a whiz-kid in web developing, or you could just be memorizing abcd’s of web development, Pingendo is for both. It enables you to start designing your page immediately after you sign up. There’s no room for wasting time, and the learning curve is not something you should worry about. Pingendo was introduced with ‘scalability’ as a basic goal in mind. Whatever you build is promised to be future proof, and changes can be made in it easily both in the immediate as well as distant future. You could deploy the site in no time, and let your clients make any teeny changes directly online. They do not have to knock your doors even for a simple change in header background color. Of course, awesome things never always come for free. 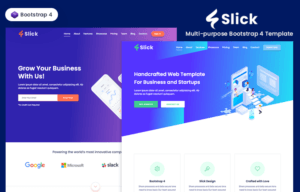 If you are new and want to be able to say that you are capable of building a responsive website, you could avail their free plan, and get your hands dirty on this drag and drop Bootstrap builder for free. 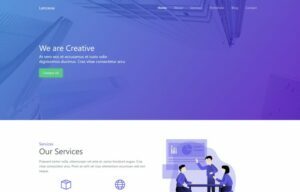 If you are serious about building a career, or simply want to build a professional website for yourself, they have got pretty affordable pricing plans. The goal of this Bootstrap Builder is relatable, and appealing to a lot of web developers out there. When they are working on a project that calls for a lot of complex functionalities, they struggle in allocating time for the design part of the website. Maybe, you are one of them. Then Bootstrap Shuffle is something you could rely on. It has got a wide range of necessary UI components, that you could implement in your site in no time. Then, you get to easily customize the Bootstrap styles from a list of extensive variables enclosed in their respective categories. Finally, download the source code, and get back to chiseling the functionality part. Bootstrap Shuffle gives a lifetime pricing plan. If you are a developer who’s got a dozen projects in hand or a single huge project that would bring you a fortune, you can invest in it without any hesitations. The first impression is precious. The formula for that is quite unknown. Developers strive to achieve that magic in their works. 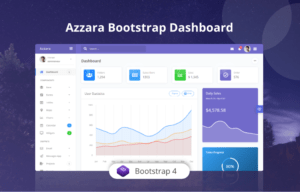 Bootstrap Studio could be one of such tools that might help you achieve that positive first impression in your project that several so-called free Bootstrap website generators out there would fail to achieve. 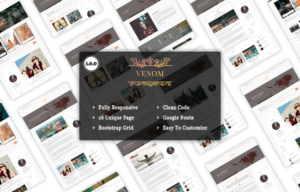 The creators of this tool have concentrated on providing the developers with all the things they need for crafting a stunning website. 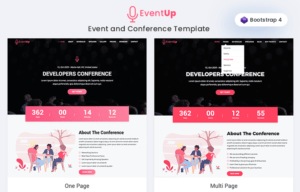 The wide range of UI components, along with downloadable component library puts the developer in a path that has no restrictions or ups and downs. Apart from that, Bootstrap Studio enables you to create and upload your very own UI component to stitching up that ‘something-is-missing’ hole that’s been torturing you from inside. The linked components feature will save you more time as you could make a change in one place, and see it automatically change the part which is linked to it. i.e. Make a simple change in header, and see it replicate in the footer as well. The pricing plan is similar to Bootstrap Shuffle. 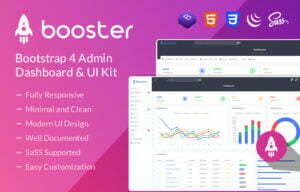 Since you cannot always get a promising drag and drop Bootstrap builder free, you could sow some of your money in this tool to reap the profit later. This one is fun and free. That’s the perfect way to define this Bootstrap builder. 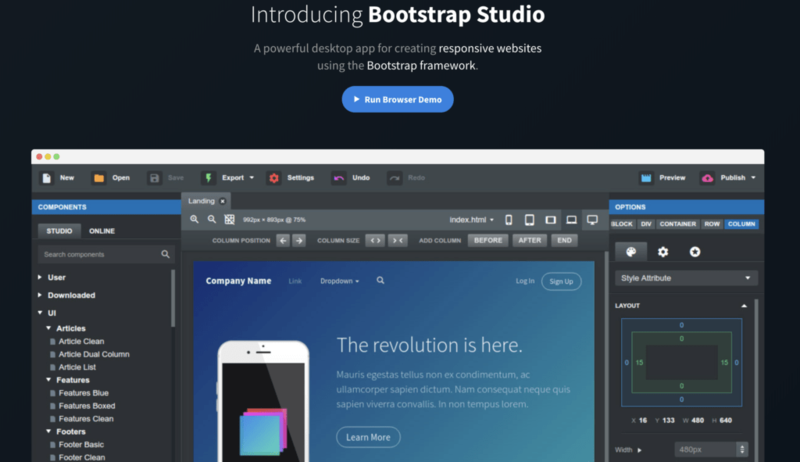 It’s a free online Bootstrap editor that warrants front end coding an easy task. 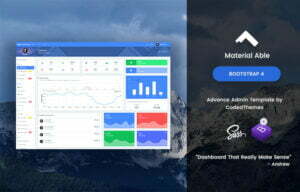 Layoutit is not as powerful as the other paid and free Bootstrap builders we have seen so far. But, it does serve its purpose. You will be able to design a web page in no time using it’s drag and drop components. 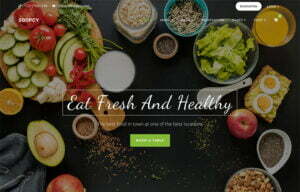 Pinegrow is indeed an impressive website builder, and could easily stand out of other Bootstrap builders in the list. It is a desktop website builder that is available for practically all operating systems. With its wide range of premium features, it could be your one-stop destination for learning, prototyping, designing, completing a project, and finally selling it in the market. With Pinegrow, you get to build components for Bootstrap, Foundation, and WordPress. Yes! WordPress, you heard it right! 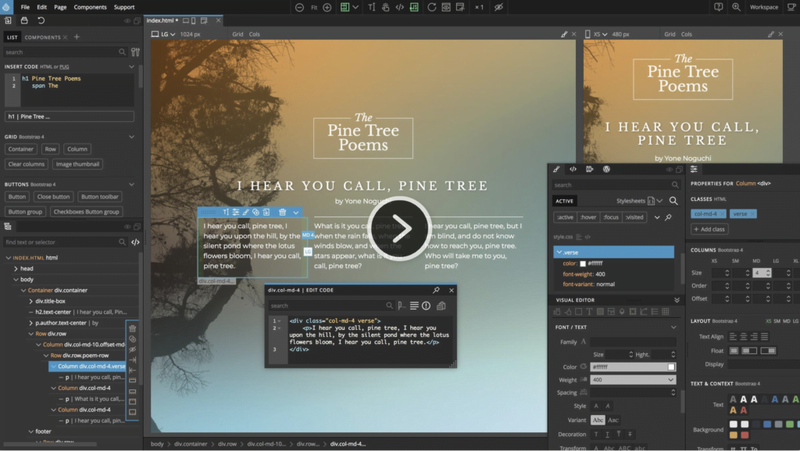 You can utilize your CSS and SAAS skills on Pinegrow to craft a perfect web page. The CSS grid editor helps you come up with impressive layout designs without costing you your blood, sweat, and tears. You get to work on your projects even offline. Just fire up the Pinegrow, and start making changes live. See your code transforming into a visual treat as you tap your fingers on the keyboard. The visual controls offered by Pinegrow are highly efficient, and once you’ve got the knack of it, you will stick to this awesome builder for a plethora of projects in the future. You could get to know more about it by installing the trial version. Pinegrow offers three types of pricing plans. 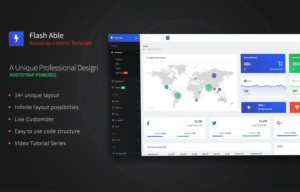 Pinegrow Standard, Pro, and Pro with WordPress. Depending on your need, you could choose a plan. Well, we have to agree that they are not that costly when we compared to other premium builders listed in this article. This builder is completely free, and at the same time, least famous in the list. It is an open source git project. Even though it doesn’t provide many functionalities like other Bootstrap builders in this list, you sure can design a decent web page. You get all the basic and necessary components for designing a page. You can surely experiment your project with this builder as this could be a kickstart for your career. This one should hold a special place in this list. While the rest of the builders are focused on Bootstrap, this one enable users to use the framework of their choice. i.e. Foundation, UI kit, Materialize, Skeleton, etc. Codeply is not simply a web page builder; it is a community. A social media for web developers. You get to view, like, and fork other awesome projects submitted by the community of seasoned developers. It is a place to learn, interact, and build your dream project. Especially, an aspiring web developer should never miss this site. Head to Codeply now and start building responsive web pages using a framework of your choice. In this case, we guess, Bootstrap! Of course, it is free. Maybe, that adds up to its awesomeness. It is no different than other free Bootstrap editors listed in this article. Since it is in its beta version currently, you could expect a lot of awesome functionalities in the near future. It has got a drag and drop editor with required components to design a complete web page. The Frontenda also provide an efficient code editor for HTML, CSS, and JS with features like autocompletion, error display, Bootstrap code snippets, etc. Thus, making the coding part easier and productive. It also features LESS visual code editor which enable you to make changes on the design visually. Finally, you can download your template, and share it online. Since Frontenda is totally free for now, it could be your preference right now.